I was so please with the product, I ordered another for my daughter and my mother. Thanks! Used for ayurvedic basti (oil enema). I have used the buckets in the past and actually prefer the bag. The oil flowed out of the bag more efficiently with the bag plus at 1/2 the cost of the bucket it is a great deal. Easy Storage. Sturdy. Safe. Lightweight. Do the enema bags and buckets come with the Castile soap? 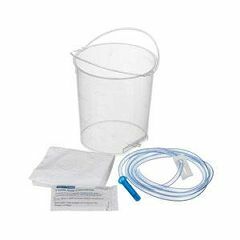 Is the tube detachable from the bucket? If so, can you re-use the clean bucket by attaching a new tube? Tube is detachable,hard to find new tubes that fit properly,that don't already come with the bucket.I just clean & reuse. Answered on Jan 6, 2014 1:49:30 PM by bucket lady from N.Y.
Do you use Bag versus Bucket? or both together? Does one dispose of them each time of use, or reuse? I use a bag, and I do not dispose, I reuse. I use a bucket. I wash it with mild soap and warm water, and re-use it for months. They are strong and well-made. Can purify with Hydrogen peroxide occasionally. I use the bag on a daily basis. I wash and reuse. I probably average using two bags a month.